← Why Do Schools Require Vaccinations? Each year vaccine companies manufacture a flu vaccine that is designed with the current strain of flu in mind. There is a great deal of research that goes into this process and ultimately, these companies are trying to provide the most effective vaccine possible so that the community is protected against the flu as much as possible. Some years the flu shot is much for effective than others. One year it can be as much as seventy percent effective while other years it can be reported to only be about ten percent effective. Less effective flu shots tend to be because the strain the shot was based off of mutated after it hit the United States. The U.S. usually bases their flu vaccine off of the Australian flu strain because the flu hits Australia first and we have time to make the vaccination before the people in the United States become ill. While getting the flu vaccine is very beneficial if you are trying to prevent the flu, you may want to think about when you are going to get the shot. You can get it in the very final weeks of the flu season but ultimately, it is better to get it as early as possible. Each year when flu season hits people scramble to get their flu shots if they have not already done so. This causes a big consumption of flu shots and more often than not, many doctor’s offices run out of the flu shot or they run so low on them that they will no longer vaccinate unless you are part of an immune-compromised demographic. You can talk to your doctor about the best time of year for you to make your flu shot appointment so you can be one of the first people to receive it. This is usually around very late summer to early fall. When your body receives the flu shot it will take about thirty days to reach its full immune potential. You can find some protection right away, within a few days of receiving the shot but if you were to come into contact with the flu early on you may still get the flu, just have lesser symptoms. If you give your body enough time to build up immunity your effectiveness rate will increase quite a bit. Some people experience some minor symptoms after receiving their flu shot such as sore throat, headache, low grade fever and nausea. You don’t want to be experiencing these symptoms in the middle of flu season and make yourself more susceptible to getting sick. 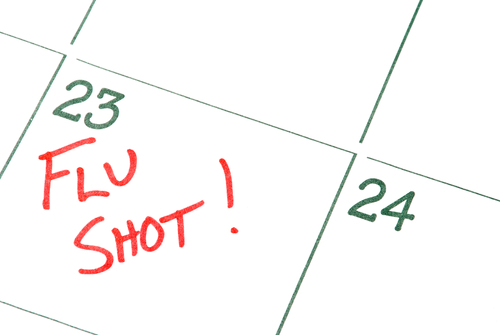 If you are scheduled for a flu shot but wake up that day feeling like you are already coming down with something, you will want to reschedule your appointment. Your body is already fighting something and in order for the flu shot to be most effective, you will want to be healthy and feel good. Not to mention that this will decrease your chances of experiencing any unwanted side effects from getting the shot. If you have any further questions about the flu shot or when you can receive it, you should contact your trusted medical professional or speak with them at your next scheduled appointment. Many people also choose to receive the shot through their place of employment or a local pharmacy, depending on what your healthcare coverage looks like and what you are eligible for. Plan ahead and this is the best way you can prevent the flu with the flu vaccine this year. This entry was posted in Flu Vaccine and tagged 2016-2017 flu, 2016-2017 flu season, 2016-2017 flu vaccines, AIDS, antiviral medication, Asthma, avoid the flu, avoid the flu virus, avoiding influenza, back to school, benefits of a flu vaccine, body aches, body temperatures, book flu vaccine, book flu vaccines, book your flu vaccine, bronchitis, Burdick ECG, buy flu vaccine, call a doctor, clean, Clorox, Cold season, complication, complications, compromised immune system, Contagious, Contamination, Diabetes, express, express medical, express-medical-supplies, expressmedical, expressmedicalsupplies, flu, flu activity, flu pre book, flu prebook, flu prebooking, flu prevention, flu season, flu shot, flu shots, flu spreads, flu symptom, flu symptoms, Flu treatment, flu vaccine, Flu Vaccines, flu virus, flu-like symptoms, get rid of the flu, Hand-Washing, headaches, health, Heart Disease, High Contamination, high risk, high-risk conditions, highly contagious, HIV, Household, how the flu spreads, Human Immunodeficiency Virus, ill, illness, immune system, immunity, immunization, immunized against influenza, inactivated flu virus, infected, infection, Infections, infectious, infectious viral illness, Inflammatory, influenza, influenza prevention, influenza virus, influzena, lab, lab supplies, Lysol, medical, Medical Equipment, Medical Supplies, medicine, organ transplant, passageways, pneumonia, poor circulation, postnasal drip, practice, pre book, pre book flu vaccines, pre book your flu vaccine, prebook, prebook flu, prebook flu shot, Prebook Flu Vaccine, prebook flu vaccines, prebook vaccine, prebook your flu vaccines, prebooking, prebooking flu, prebooking your flu vaccine, preventing the flu, protect against the flu, protection against the flu virus, running nose, runny eyes, school, seasonal flu, seasonal influenza, sick, Sick Room, sickness, sneezing, spread of flu, spread of flu germs, spread of influenza, spread of the flu virus, spreading the flu, spreading the flu virus, stay healthy, stay healthy this flu season, supplies, symptoms, temperatures, tissues, types of flu, understanding flu, Vaccinated, vaccinations, Vaccine, virus. Bookmark the permalink.